Girl Scout Cookie Sales. Beware, be prepared, be glad. Starting this evening, happy Girls Scouts will be taking Bainbridge Island by storm selling cookies outside of: Safeway, Town and Country Market, Silverscreen Video, and they’re going to try and catch you coming off the ferry too. Clear the freezer out because Thin Mints only come once a year and they freeze really well! Have your cash or check ready ($4 a box) because sales will only last until March 16th! Dan Budiac, a New York Web developer and Apple/Mac fan, this month, purchased an unused, unopened Apple II from e-bay, which first shipped from Apple in 1988. I relate to his nostalgia, having learned desktop publishing as a high school student on a Macintosh II. Follow the link below for some fun picts and a letter to Steve Jobs from Dan Budiac. Having grown up in the East Bay and Sacramento, California, living so very close to so much water is relatively new for me. I am still sometimes caught off guard when I wind down Blakely Avenue and almost drop into Eagle Harbor. Or when I am touring around, looking at houses and boom, I come to the edge of a cliff to find Manzanita Bay. You can’t get very far around here without running into the water, which, well, I must admit, is pretty great. But, with the hustle and bustle of daily life, which includes family, work, sports, errands, we constantly have to remind ourselves to head out to the water, to make the time to enjoy it. My kids love going to Fay Bainbridge Park on the north end of the island. They love to collect sticks and rocks and dig for clams at low tide.I love to watch them run around while I gaze at Seattle and try and spy bald eagles.The setting is truly amazing.And when we are there, I wonder why we can’t get there more. Lytle Beach is another beach well worth exploring. Being on the southern end of the island, it is usually more sunny and warmer than waterfront spots on the north end. Folks that live near by have great beach access and the beach has lots of interesting shells and rocks for inspection and collection. While there, you can enjoy the view of Rich Passage and watch the Bremerton Ferry wind its way to and fro. And, on a clear day, which we have had a string of lately, Mt. Rainier is ever-present. The other night, taking advantage of the lengthening days, we headed out to Hawley Cove Park out at Wing Point, very near the ferry terminal.From the parking area you can walk (my kids like to run because it is downhill) on an easy, path down to the water.Once there, you can access the beach and have a front row seat when the ferry docks.It is kind of cool to be digging in the sand and look up and see the ferry right there, like it appeared out of nowhere. My husband is great at getting the kids out and about and he and our youngest especially like to fish. An easy spot with kids is Point White Dock out at Crystal Springs. 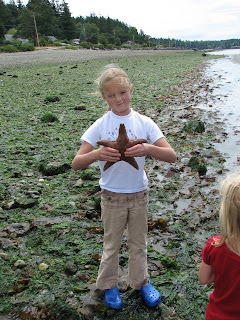 The dock is convenient to fish from and there is a rocky beach to explore where you can find very large, very colorful sea stars or starfish. I haven’t seen any fish come home, but they have had fun catching and releasing the small fish they have reeled in. So, join us, throw caution to the wind and clean that bathroom next weekend. Hit the beach, hit the trails, remember to take advantage of all the island has to offer. One fabulous thing Bainbridge Island has going for it is its wide selection of high-end, ferry-close, harbor view condos. If when you think of condo, you think of a cramped, dark, noisy space, think again about condos on Bainbridge. The best benefit to living in a condo on Bainbridge is that many of them are located in or near Winslow within walking distance to shops, restaurants, the ferry, grocery shopping, the theater, gyms, etc. If you want to ditch your car and commute to Seattle, the ferry and your feet could be all you need. Condo living offers an easy lifestyle. A new condo, in Winslow, can be purchased new from the 300’s. The key word here is new. These new, high end homes, like the town homes and flats in Madrone Village offer quality finishes like wood floors, fir trim, stainless steel appliances, large windows, and solar tube sun lights. Venturing into the $400-600K range can afford you a harbor view and square footage into the 1300’s and up. Now, if you are looking for an entry level condo and it does not need to be new, resale prices start at $169K, but a two year old resale condo, that was never lived in is $211K at Island Crossings. Many buyers are excited when they start looking at condos, but sometimes get turned off when they see the association fees. However, if you take a closer look, you’ll see that the fee usually includes a large array of utilities and benefits, like phone lines, exterior homeowners insurance, garbage, water, sewer, parking, security, exterior maintenance, and cable and reserves for future maintenance like a new roof. They could go on to offer a work out room, pool, computer lab, etc. When you add up all of these items, you usually find that the home owner’s dues are quite fair. Current research has shown that “80 percent of (condo) residents said they received a good return for their assessments in the form of such services and amenities as landscaping, trash pickup, exterior lighting, pools and tennis courts. Monthly assessments paid by interviewees ranged from less than $25 to in excess of $500.” See the article Are Condo Dwellers Happy? Study ranks satisfaction, written on February 1st, 2008 for some timely information about how happy condo residents actually are. Once people move into condo life, overall, they appreciate the association running their complex, and actually enjoy all those rules. The Are Condo Dwellers Happy, article goes on to say that, “74 percent believe rules protect and enhance property values.” More than likely residents enjoy the fact that people are not hanging up purple curtains or parking their old RV in their reserved parking spot. Clean white window coverings, neat patios, well-kept landscaping and a lack of RV’s can do wonders for your home value. See also HOAs Get High Marks for more on that topic. The main appeal, I found, after touring the new condos on the market is that they all speak to the idea of a simpler existence. If you have a little less space, it affords you greater things like a view and beautiful, quality finishes. And, you have your choice of personal style from what is on the market. Madrone Village offers homey, classic architecture, with bead board and craftsman era trim. Seabreeze on Bjune offers some of that same feel with a more modern, urban feel in its exterior architecture. All of the work has been done in these fine, new condos, they just await your selection and inhabitance. Note: In my annual blog “clean-up” many article links were removed from this blog post, as they were broken. Houses are still selling in one weekend here on Bainbridge Island. The media is continuing to have its field day about prices falling and homes lingering on the market for a year and then perhaps going into foreclosure, but if you want to buy a home on Bainbridge Island, time might not be on your side if your goal is to save money. Houses are still selling quickly on the island if they are priced correctly and prepared properly for sale. If a seller is trying to double their money on a house they bought two years ago and did nothing significant to raise the value of their house (oh, yes, those are out there, I walked through one the other day) it will sit on the market. The Haley Loop home was purchased new for $1,050,000 in October of 2006 and went into contract in January of 2008, being resold in just over a year. The home’s asking price was $1,360,000. If the home closes near asking, you are looking at approximately a $300,000 difference in just over a year. Now, surely not every home is selling as quickly and with such steep appreciation, but prices on the island are still going up. Home prices are increasing in the desirable areas, and most folks ideally want to be in those areas when they buy their “forever” house. With the media coverage and mortgage “crisis” looming, buyers are smarter than they were a couple of years ago. They are asking for facts and figures, looking at what is a good value and what is not. Buyers still want to earn equity on their purchase in a time when equity is more challenging to acquire. Overall, an area like Bainbridge Island, with a finite amount of land, continues to be a good investment, applying the simple rule of supply and demand. So, if you are waiting to make your move to Bainbridge Island when prices go down, you’ll be waiting a very long time, because here on the island, time is not on your side.